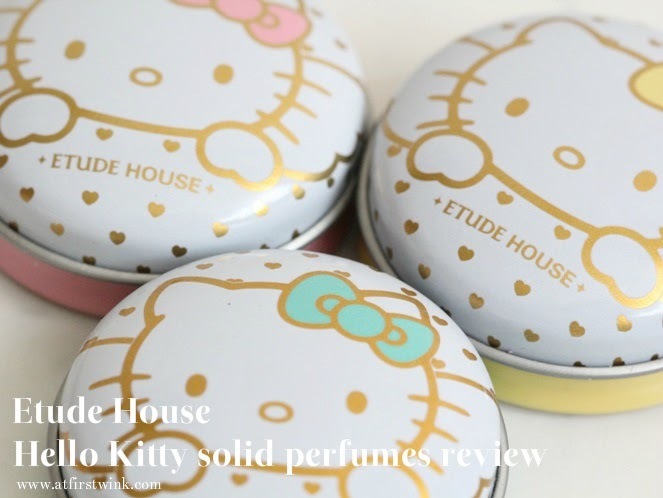 The Etude House Hello Kitty solid perfumes come in a cute plastic packaging and there are three kinds of scents: Tender Powder, Cutie Tropical, and Sweet Fresh. It is in the same order as pictured underneath. 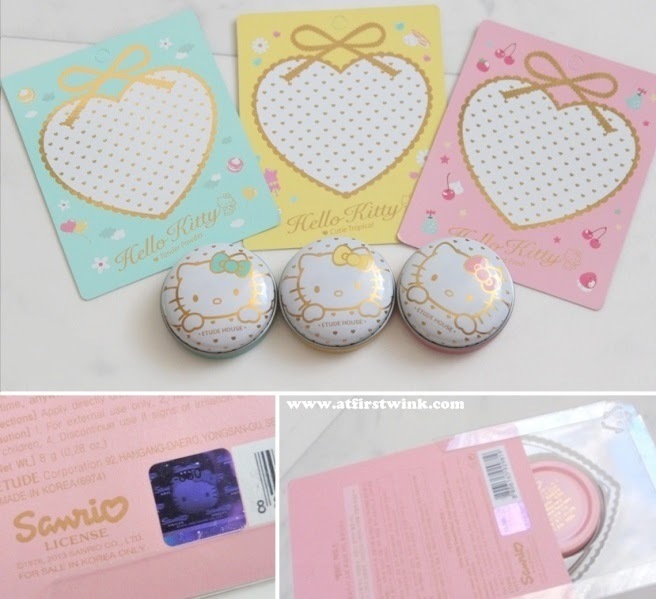 The solid perfume tins (or Cake Fragrances as Etude House named them) have a cute Hello Kitty print on the front and the same "ancient" gold is used for the print on the back of the tin. The gold doesn't look as nice as I thought it would be, but it is acceptable. So what do I think of the scents? Since the It's skin Macaron solid perfumes really won me over, I expected these to be great too. The scents do stay on your skin for quite a while, although you have to be quite close to smell it. The scent that I was the most interested in, was the Cutie Tropical (yellow). The top note is great as I like fruity scents and you can really distinguish some of the tropical fruits, but the floral can get a bit heavy at the start. Luckily, it fades away after a while. I don't know if it is the citrus, but it leans a bit to a sour fruity scent. The second scent that I want to try is the Sweet Fresh (pink). From the description, I though it would be too floral for me, but when I put it on me, it has a surprisingly fresh side to it. Although you can smell the musk right away, the leafy green (or is it the blackcurrant?) wraps around it and it almost has the same effect as a green tea scent, as it makes the heavy scents less heavy. Faintly, you can also smell the orange and lemon. Lastly, I tried the Tender Powder (blue). I don't really like the smell of baby powder, but it has some interesting elements in there, so I decided to buy that one too. Sadly, it has the baby powder scent that I was afraid of. The strong, sweet anis note and a bit of the floral notes help make the scent more interesting, but overall, it has the typical baby powder fragrance. If I have to choose, I think that the Cutie Tropical has the nicest scent. The Sweet Fresh solid perfume has an interesting scent, but I am not sure if everyone likes the fresh/sharp note that can be found in there.